Belmont University will hold its spring 2017 commencement ceremonies for graduate and undergraduate students on Saturday, May 6 in the Curb Event Center. Belmont anticipates the graduation of 1,161 students with 884 bachelors, 91 master’s and 186 doctoral degrees conferred. At 9:30 a.m. candidates from the Jack C. Massey College of Business, Mike Curb College of Entertainment and Music Business, College of Sciences and Mathematics, College of Theology and Christian Ministry and University College/Interdisciplinary Studies will have their degrees conferred. 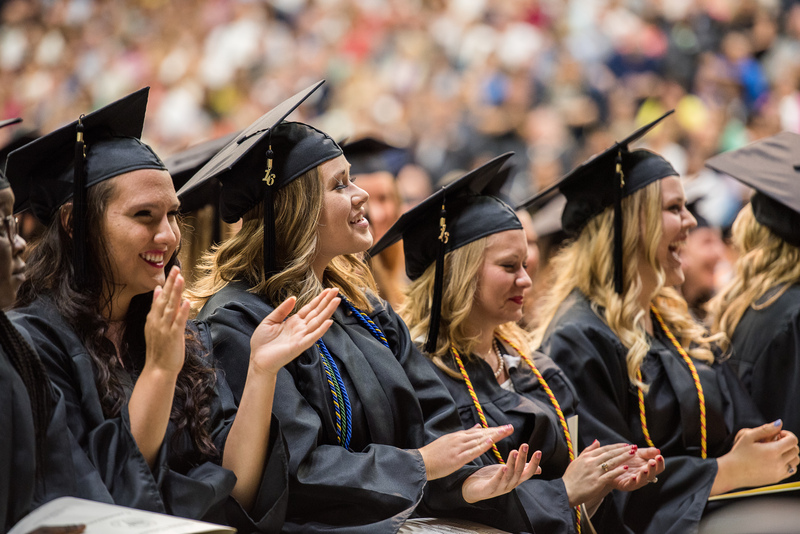 At 2:30 p.m. candidates from the College of Law, College of Liberal Arts and Social Sciences, Gordon E. Inman College of Health Sciences and Nursing, College of Visual and Performing Arts and College of Pharmacy will have their degrees conferred. Tickets, which have been distributed to the graduating students, are required for guests wishing to attend either event. Dr. Bob Fisher, president of the University, will preside over the events and present the commencement address at both ceremonies. Watch the graduation ceremony live by clicking here during the ceremony. Baccalaureate will take place at 1 p.m. Friday, May 5 in the Curb Event Center. Covering the topic “A Service of Ordination to Daily Work,” the worship service for graduates and their families will feature students from various disciplines sharing stories of how God is calling them to use lessons learned at Belmont to serve others.